American Mars lander. NASA's rover mission design for the 2003 Mars launch opportunity. AKA: Mars Exploration Rover;Opportunity;Spirit. Status: Operational 2003. First Launch: 2003-06-10. Last Launch: 2003-07-08. Number: 2 . Gross mass: 1,063 kg (2,343 lb). 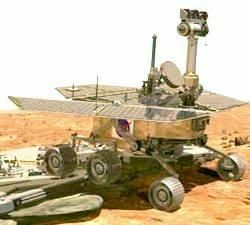 Two separate launches of Mars Exploration Rover spacecraft were made on June 10 and July 8, 2003, with the objective of landing two rovers to separate sites on Mars in January 2004. Primary among the mission's scientific goals was to search for and characterize a wide range of rocks and soils that hold clues to past water activity on Mars. The spacecraft were targeted to sites that appear to have been affected by liquid water in the past. After the airbag-protected landing craft settled onto the surface and open, the rovers were to roll out to take panoramic images. These would give scientists the information they needed to select promising geological targets that would tell part of the story of water in Mars' past. Then, the rovers would drive to those locations to perform on-site scientific investigations over the course of their 90-day mission. Miniature Thermal Emission Spectrometer (Mini-TES): for identifying promising rocks and soils for closer examination and for determining the processes that formed Martian rocks. The instrument would also look skyward to provide temperature profiles of the Martian atmosphere. Moessbauer Spectrometer (MB): for close-up investigations of the mineralogy of iron-bearing rocks and soils. Alpha Particle X-Ray Spectrometer (APXS): for close-up analysis of the abundances of elements that make up rocks and soils. The Moessbauer Spectrometer and the Alpha Particle X-ray Spectrometer would analyze the particles collected and help determine the ratio of magnetic particles to non-magnetic particles. They would also analyze the composition of magnetic minerals in airborne dust and rocks that had been ground by the Rock Abrasion Tool. Magnets: for collecting magnetic dust particles. A goal for the rover was to drive up to 40 meters in a single day, for a total of up to one 1 kilometer. Moving from place to place, the rovers would perform on-site geological investigations. The mast-mounted cameras were mounted 1.5 meters high and provided 360-degree, stereoscopic, human-like views of the terrain. The robotic arm was capable of movement in much the same way as a human arm with an elbow and wrist, and would place instruments directly up against rock and soil targets of interest. In the mechanical "fist" of the arm was a microscopic camera that would serve the same purpose as a geologist's handheld magnifying lens. The Rock Abrasion Tool served the purpose of a geologist's rock hammer to expose the insides of rocks. Cruise Stage: Provided services for travel between Earth & Mars. 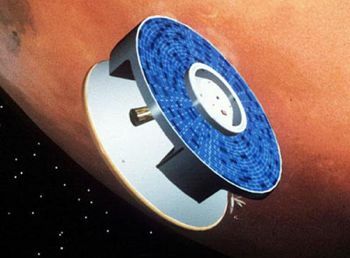 It was very similar to the Mars Pathfinder design and was 2.65 meters in diameter and 1.6 meters tall when attached to aeroshell. It had a launch mass of 1063 kilograms. The primary structure was aluminum with an outer ring of ribs covered by the solar panels, which were 2.65 m in diameter. Divided into five sections, the solar arrays provided up to 600 Watts of power near Earth and 300 Watts at Mars. Heaters and multi-layer insulation kept the spacecraft electronics warm, and a Freon system was used to remove heat from the flight computer and telecommunications hardware inside the rover. Cruise avionics systems allowed the flight computer in the rover to interface with other electronics such as the sun sensors, the star scanner, and the heaters. Entry, Descent, and Landing System: Used for entry into the Martian atmosphere. Included the aeroshell (consisting of a heatshield and backshell), the parachute, the airbags, and a lander structure. Entry, descent, and landing for the Mars Exploration Rover mission was an adaptation of the Mars Pathfinder method. First the aeroshell and the parachute decelerated the lander through the Martian atmosphere. Then, prior to surface impact, retro-rockets were fired to slow the lander's speed of descent, and airbags were inflated to cushion the lander at surface impact. After its initial impact, the lander bounced along the Martian surface until it rolled to a stop. The airbags were then deflated and retracted, and the lander petals and rover egress aids were deployed. Once the petals opened, the rover deployed its solar arrays, and placed the system in a safe state. Communications during entry, descent, and landing were to occur through a pair of low-gain antennas, one mounted on the backshell and the other on the rover itself. About 36 ten-second radio tones were to be transmitted to Earth during descent through the atmosphere, which would take approximately six minutes. These tones were coded to indicate the accomplishment of critical steps in the entry, descent, and landing timeline. Rover: The wheeled vehicle with science instruments for discoveries on the Martian surface. The rover design was based on the Athena Rover on the previously cancelled Mars 2001 lander mission. Electric System: 0.30 average kW. Family: Mars lander. Country: USA. Launch Vehicles: Thor, Delta, Delta 2 7000, Delta 7925, Delta 7925-9.5, Delta 7920H, Delta 7925H. Projects: Mars. Launch Sites: Cape Canaveral, Cape Canaveral LC17B, Cape Canaveral LC17A. Agency: JPL, NASA. Bibliography: 2, 3910, 3911, 3912. 2004 January 3 - . Spirit Rover Mars Landing - . Nation: USA. Spacecraft: MER. 2004 January 4 - . Mars Exploration Rover A (Spirit), Mars Landing, Succesful - . Nation: USA. Spacecraft: MER. Spirit Rover Drives Onto Martian Surface - . Nation: USA. Spacecraft: MER. 2004 January 25 - . Mars Exploration Rover B (Opportunity), Mars Landing, Successful - . Nation: USA. Spacecraft: MER. Opportunity Rover Mars Landing - . Nation: USA. Spacecraft: MER. 2004 January 31 - . Opportunity Rover Drives Onto Martian Surface - . Nation: USA. Spacecraft: MER. 2004 April 5 - . Spirit Mars Rover, End of Primary Mission - . Nation: USA. Spacecraft: MER. 2004 April 26 - . Opportunity Mars Rover, End of Primary Mission - . Nation: USA. Spacecraft: MER.